This would be an easy project for any Cub Scout to work on. 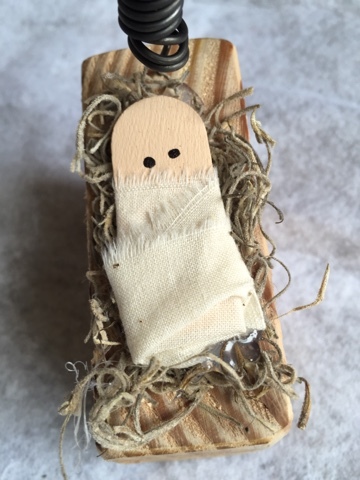 Such a cute project of Baby Jesus. Are directions for this project available? Baby Jesus looks like the end of a tongue depressor painted flesh color, two dots for eyes and wrapped in a torn strip of fabric. Wrap wire around a pencil and pull it off. Poke one end in a pre-drilled hole in the base and the other in a pre-drilled hole in the star. Hot glue some Spanish Moss onto base and baby nestled on top. The only slightly tricky part of this is making sure you have a wire that is strong enough to hold the star up. 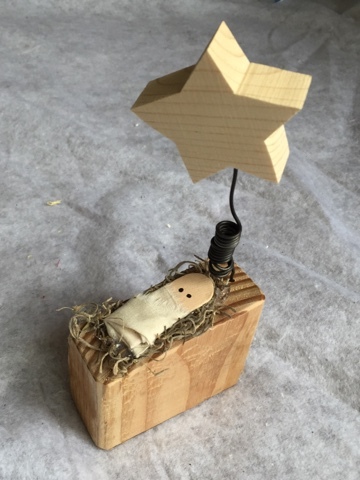 Another option would be to use a fun foam star or a thin Balsa wood type star and just glue the wire to the back of the star!